Edwin Scales, solo practitioner, was driving to his law office in Key West on a Friday morning last October when his cell phone rang. “Hey, Ed, this is Rick Scott,” the voice said over the phone. Scales, who had been nominated to sit on the Third District Court of Appeal, thought one of his friends might be playing a prank on him. The last time Scales had been nominated to the court, his friends had tricked him with hoax calls from the governor. But this time, the voice sounded authentic. Scales pulled over to the shoulder of the road. “Gov. Scott,” he said. Two and a half months later, Scales, wearing a black robe, sat behind the bench in the Third District’s courtroom in Miami for his first oral argument as a judge. For Scales, who had worked in private practice his entire career, his professional landscape had abruptly changed. So had the rest of his life. Instead of living at home in the Keys and hosting a radio show on the weekends, Scales was living in an apartment in Coral Gables and reading briefs in chambers every Saturday and Sunday. 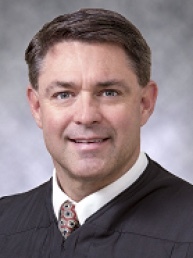 Scales’ appointment to the bench also marked a change for the Third District Court of Appeal. Scales became the first Monroe County lawyer appointed to the court since its creation in 1957. Although the Court’s jurisdiction covers Key Largo and the Florida Keys, the Court had exclusively drawn its ranks from Miami’s bar and bench. Key West was 153 miles and a world away. Scales was born in 1966 in Birmingham, Alabama, and raised in Lakeland, Florida, a small town in Central Florida dominated by the citrus industry and phosphate mining. His father was an engineer. His mother was a public school teacher who filled the home with music. The radio was a little box, but, for Scales, magic came out of it. As a child, Scales dreamed of becoming a broadcaster. At Lakeland High School, he called play- by-play at football games. At the University of Florida, he was the “mike man” and head cheerleader for the Florida Ga- tors. He studied tele-communications and worked on the business side of The Independent Florida Alligator. “I had a passion for journalism,” Scales recalled, “and still do.” But even in the 1980s, Scales saw that the broadcasting business was facing financial challenges. To get a decent job, you had to move to Los Angeles or Chicago. “It seemed more practical to go to law school,” Scales said. He enrolled at the University of Florida College of Law. Scales was popular on campus. During law school, he served as president of the university student body. He was also named as the University of Florida’s outstanding male graduate as an undergraduate. He was inducted into the University of Florida Hall of Fame, and appointed by then Gov. Bob Martinez as the student representative to the Board of Regents, the government agency that oversaw the state university system. In 1998, he got a phone call from a classmate about a job at Historic Tours of America, a national site-sighting company based in Key West. Scales had spent almost his entire life in two Southern towns, Lakeland and Gainesville. The job at Historic Tours of America gave Scales exposure to a substantial business commercial practice, including real estate matters, employment issues, and government relations across the United States. The job also allowed Scales to live in Key West, a city unlike any other in Florida. In some ways, Key West was a small town like Lakeland. Yet, it was completely different. Key West had big city flair. It had great restaurants. It had character and eccentricity, including parties like Fantasy Fest. The island was also beautiful, with warm breezes and blue water that stretched to the sunset. About three years after moving to the island, Scales ran for a seat on the Key West City Commission. He wanted to serve his new home, and had been taught that lawyers built their practice by building their community. He won a four-year term. But elected office did not suit Scales well. “I am a lawyer first and foremost, and I am not much of a politician,” Scales recalled. “It was a tough four years.” Because Scales had returned to private practice in Key West, he often ran into conflicts that prevented him from voting on matters that affected his clients. He joked that he had the Florida Ethics Commission, a board on which he later served, on speed dial to get advisory opinions about conflicts. When his term on City Commission ended, Scales did not seek re-election. “I wasn’t too terribly upset when the term ended,” he said. His legal work, though based in Key West, took Scales across the state. He became “of-counsel” to the Florida law firm Gray Robinson. He also succeeded a former partner who was stepping down as general counsel of the Florida Citrus Commission. As counsel to the Commission, Scales handled administrative law issues, dealt with marketing and business matters, and worked on agricultural problems. Scales also served on the judicial nominating commission for Florida’s Sixteenth Judicial Circuit, which covers Monroe County, and the Federal Judicial Nominating Commission, which screens applicants for the federal bench in the Southern District of Florida. He was appointed to the board of trustees of the Florida Keys Community College and the Florida Ethics Commission, and was elected to the Board of Governors of the Florida Bar. Even as his practice grew, Scales wanted to fulfill his long-time goal of becoming a judge. He had always aspired to sit on the district court of appeal. Decision making on the appeals court is “the most dynamic process in Florida government,” Scales said, and the work product of the appeal courts is “the gold standard” for lawyers. Attorneys rely on the district courts’ opinions every day to craft arguments and solve clients’ problems. “That is why I applied 144 times” for the post, joked Scales, who, like many judges, was nominated three times before Gov. Scott appointed him. To climb what he describes as a “steep learning curve,” Scales works seven days a week. He rented an apartment in Coral Gables to be close to the court. He also hired a veteran staff. His two law clerks previously worked for retired Judge Alan R. Schwartz and Chief Judge Frank A. Shepherd. His judicial assistant is a courthouse fixture, whose mother also works at the Third District. Since taking the bench, Scales said he has learned how the court works collaboratively to reach decisions about cases. As a practitioner, Scales did not fully appreciate how the deliberative process works and how judges use oral argument to communicate with each other. Oral argument “helps you understand where your colleagues are coming from,” he said. Instead of writing briefs, Scales is now reading briefs — lots of them. The court has a 50-page limit for initial and answer briefs. “Fifty pages is not a minimum., Scales said. “Brief is best.” He recommends that counsel begin briefs with their strongest points and concentrate on their best arguments. When briefs are cluttered with every possible argument, strong arguments can get lost. While Scales cannot pull young lawyers into his chambers to critique their arguments, as trial judges did for him when he started, Scales wants to give back by mentoring law students and becoming active with the Bar. Scales also wants to represent Monroe County well. He knows that lawyers will look at him, as the first judge from Key West, as a representative of the Bar in Monroe County. “I am committed to making sure the Bar knows me as the author of strong opinions, not as the strange guy from Monroe County with the Beatles posters in his office,” said Scales, whose chambers are dominated by full-sized posters of Bob Dylan and the Beatles, as well as all types of Gator memorabilia. Still, Scales hopes to maintain a presence in the Keys. The court administrator in the Sixteenth Judicial Circuit has offered Scales an office in the courthouse in Key West. Scales hopes to work there from time to time. Scales is also considering returning to his weekly radio show, the “Ed Scales Show,” on Keys radio station US-1. He obtained an opinion from the Judicial Ethics Advisory Committee that he can host the radio show as long as he follows certain restrictions on a judge’s outside work. Later this year, the Third District will also hold oral arguments in Key West, as it does annually. Usually, the judges sitting in Key West must drive three and a half hours for the sitting. But this year, for the first time, one of the judges on the court could already be home. David A. Karp is an associate in the Coral Gables office of León Cosgrove LLC and handles appeals in state and federal court. He is a graduate of Yale University and the University of Florida College of Law, and clerked for U.S. District Judge Susan Bucklew of the Middle District of Florida.